In Wiping, you have to clear the screen of all the bad guys, while collecting extra bonus items. You control a vacuum cleaner which goes round the screen clearing the floor. You have the ability to stun the monsters in front of you using your nozzle. 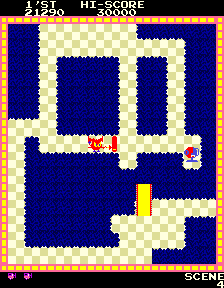 The monsters on screen can only freely walk on cleared parts of the floor, but they can shortcut across covered floor when they are homing in on you. At the start of each level, the positions of four items are shown which can be collected for bonus points. The bonus items disapppear from view when you start the level, but if you collect all four, a crown appears in the centre of the arena. Collect the crown and all the monsters on screen are frozen for few seconds and can be killed by walking into them. There are three carpets positioned on screen, which roll up behind you when you walk across them, killing any monsters they hit. Each time a carpet is rolled up it gets shorter, and after rolling up 3 times it disappears. There are three types of monsters you have to deal with. Baddon is small, fairly slow and stupid and will readily follow you onto a carpet. Bilbola is bigger, a little bit smarter and doesn't so readily follow you to its death. Bigimba is equipped with a retractable spike which it will fire at you if you are in range, causing you to lose a life. All three monsters can be outrun at the early stage of the game but they get faster as the game progresses until they will catch up with you and kill you. At the start of each screen, all the monsters are fixed into set movement patterns, moving only a few squares back and forth horizintally or vertically. They will move from this pattern if you clear an area of floor crossing one of their territories. Also after some time they will break from their positions, following you. 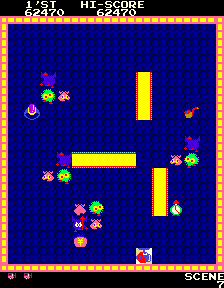 The last monster on screen will attempt to escape by running to one of the carpets and disappearing under it. If it makes it to a carpet the level ends and you move on to the next level. Scoring Clearing a square of floor: 10 points. Killing 1 Monster With Carpet: 1,500 points. Killing 2 Monsters With Carpet: 3,000 points. Killing 3 Monsters With Carpet: 6,000 points. Killing 4 Monsters With Carpet: 10,000 points. Bottle, Bag, Telephone, Clock, Teapot, Pipe: 1,000 points. Rugrats: Released by Nichibutsu one year later (1983), the main differences in this version of the game are that the bonus items remain visible at all times, and there are only three to collect instead of four (moneybag, gold bars and ring). This makes the game easier to play, as it is not as difficult to get the crown. As a consequence, Rugrats is higher scoring than Wiping.